Hello everyone! Thanksgiving is less than a week from today and I hope you all have a great Thanksgiving preparation week so far. We will be so easy to get caught into the craziness and busyness of preparation, but by remembering the goodness He has done in our life, we give thanks to the LORD, from whom all the blessing we have received all year long. And let’s our hearts be filled with thanks and giving for the next year to come. Today we are taking a look back at Our Daily Bread Designs November Release, here is the card/project I created using ODBD – Jesus Loves You Stamp/Die Duos set, ODBD Custom Die – Snowflake Sky, ODBD Snowflake Season Collection – 6×6 paper pad, and ODBD Custom Die – Stitched Ovals. For the sentiment label, I die cut a white cardstock with one of the ODBD Custom Die – Stitched Ovals and then embossed it with the same die. 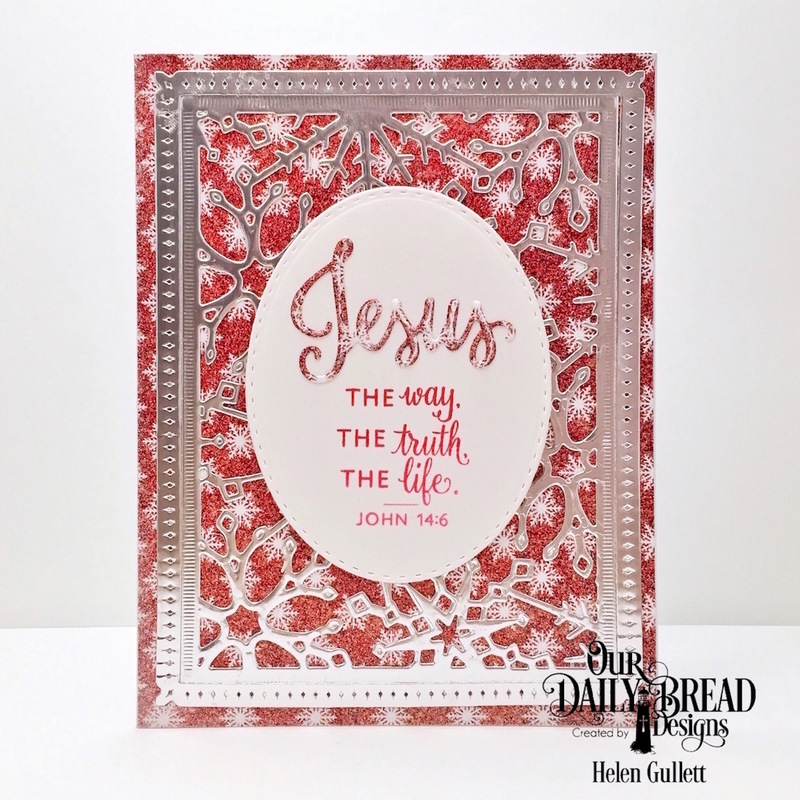 Then I stamped the sentiment from the ODBD – Jesus Loves You Stamp/Die Duos set on the oval die cut with Red mini ink pad. I die cut one of the patterned paper from ODBD Snowflake Season Collection – 6×6 paper pad with the Jesus die cut that comes from the ODBD – Jesus Loves You Stamp/Die Duos set. Also, before I remove the die cut of the die, I run it through again my machine to embossed it. Love the extra texture on it after the embossing. Then I added the die cut Jesus on the label base with Liquid Glass glue. For the background paper, I used the ODBD Snowflake Season Collection – 6×6 paper pad. I cut it into 4.25″ x 5.5″ and added it on the A2 card base. And then I die cut a piece of silver foil paper (DCWV) with the ODBD Custom Die – Snowflake Sky, and then embossed it with the same die for extra texture on them. I added the die cut background on the card base with Liquid Glass glue (CTMH). I hope you are inspired to create as you are preparing for celebrating the birth of our Savior! Thank you so much for visiting me and have a fabulous blessed day! Hi Helen! I love your beginning about Thanksgiving and Christmas!! Your card is beautiful! I love the silver Snowflake Sky as a bg for your sentiment oval!! It seems so perfect, one of God’s beautiful creations as a backdrop for those beautiful words, “Jesus, the way, the truth, the life!! !” Gorgeousness! Thank you so much, Robin!! Such a pretty card, Helen! Gorgeous card Helen, great use of the die. Hey Helen! Gorgeous card here, with the red background and the silver overlay. It totally shines! Gorgeous card with such a lovely die! And, the sentiment is perfect!! Gorgeous, love the silver frame against the red!! Thank you so much, Anita!